“Environment”, “MaxConcurrentChecks”, “NodeName” are special global constants, the other keys are registered namespaces. You can access specific constants either via namespace prefix, or without. Coming from v2.9 and older, nothing changes if you’re using global constants and functions. There’s one safety warning in place though: When you’re overriding a constant at some later point, the configuration compiler will log a warning including the file and line details. Think of your own safe place for constants and functions. if we would have a namespace. With v2.10, you have and I’ll show you in a bit how to solve this. Prepare the configuration and include the newly created “namespaces.conf” file in your “icinga2.conf” configuration file. This is safe, and when you now open the debug console, the namespace isn’t used globally yet. Namespaces can be loaded into the current scope with the “using” keyword. Edit “namespaces.conf” again and add the following after the namespace declaration. Note: This loads the namespace immediately. You can also move this into a specific configuration file on top – think of Python package imports for example. 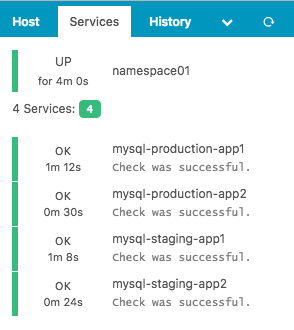 Now restart Icinga 2 and use the debug console to connect to the running instance via REST API. The above example shows you how to access an attribute registered in this namespace. You can use that in your configuration objects and apply rules then. Thanks to loading the namespace, you can directly access the namespace variables too. Next to specific variables in namespaces, you might want to register functions in a specific namespace. This keeps the global namespace safe and no-one is allowed to override this function by accident. Go with a simple example which flattens a nested dictionary like this (e.g. from a host “vars” dictionary). Note: The debug console requires to explicitly load the namespace again for tests. The configuration snippet above already takes care for the config compiler. v2.10 will be released end of September. Special thanks to Gunnar for implementing this nifty feature. Well, to be fair… this was added to the upgrading docs for 2.10 after we reported (https://github.com/Icinga/icinga2/issues/6507) that it broke stuff in 2.9. The 2.9 upgrading docs do not mention the new constant.